How much is too much for a Chromebook? The Pixel is most powerful, fastest and best-designed Chromebook ever made, but you don't need this much performance to run a web browser. The original Chromebook Pixel was infamous for being the most expensive and insanely specced Chromebook, equipped with a high-resolution and equally unorthodox 3:2 screen. It was expensive and luxurious, thanks to its all aluminum body and worse yet, the original Pixel's battery life was underwhelming. Since then, Chromebooks have exploded in popularity and Google's Chrome OS experiment has matured into a well oiled cloud platform. Now, two years later, the new Chromebook Pixel has been introduced as the next step forward. Google equipped the new Pixel with the same 2,560 x 1,700 screen, an even more powerful Intel Core i5 Broadwell chip plus a much longer quoted 12 hours of battery life – all at a lower (but still premium) $999 or £799 (about AU$1,277) price. In many ways, the new Pixel is the Chromebook perfected, but that doesn't necessarily mean it's an ideal machine for the average Joe. 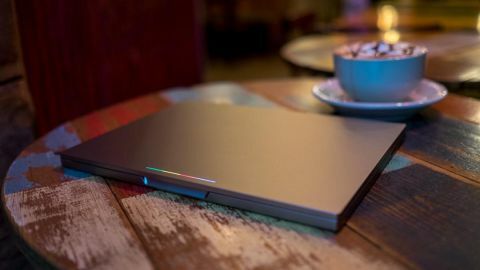 Every time I've seen the Chromebook Pixel in photos, it instantly reminded me of the Delorean, and not in a good way. It seemed tacky and bland with a sheet-metal body that seemed utterly derivative of the '80s car. Thankfully, in person, I was proved completely wrong. Seeing the Pixel in images is one thing, but holding it in your hands is a completely different experience. The Pixel comes in the form of a solid aluminum slab that's very reminiscent of the MacBook Air, but its made with a smoother, slightly softer metal. Open up this laptop and it reveals its completely bare, elegant and utilitarian design. What sets the Pixel apart from other Chromebooks is its minimalism. There's barely any branding on the device, save for the word Chrome etched into the laptop rear hinge as well as at the top of the keyboard deck. From the the lowered lip around the keyboard to the keys themselves and the track pad's edges, the laptop as a whole follows one sharp, square-shaped aesthetic set by the 3:2 screen. Likewise, the edges of the machine fall off sharply to make it feel utterly modern. The Pixel is easily recognizable, thanks to its uniquely square aspect ratio. Not to mention that unmistakable, multi-colored light bar on the back of the screen, which displays all the primary colors of the Google logo. Ingeniously, this lightbar also doubles as an battery meter that comes to life with a progress bar whenever you double tap the back of the lid. It's hard not to appreciate all the minute details Google has gone over with a fine-toothed comb. Everything about the about the design is quite deliberate and well thought out. The new USB-C ports are some of the most important new additions to the Chromebook Pixel. The new USB 3.1 port is a big deal, in light of its recent debut with the new MacBook. However, unlike Apple's latest laptop, the Pixel comes with two of these new fangled ports instead of just one. Alongside two full-size USB 3.0 ports, an SD card slot and a headphone/mic combo jack round out the Pixel's I/O offering. Overall the new USB-C ports come as a boon to the laptop rather than to its detriment. The two ports are located on both sides of the laptop, letting you plug in the charger on either side of the device. At the same time, the availability of legacy ports means you won't be bogged down with adapters, as you are with the new MacBook. If anything, USB-C's expandability to displays and external batteries adds a bit more flexibility (and future proofing) to this machine over other Chromebooks.